Around 20,000 people die in India every year in fire incidents, according to the ministry of statistics and programme implementation. According to statutory guidelines in the fire service manual, fire trucks need to cover one km in one minute and reach an accident site within 10 minutes. This is exactly where fire fighting bikes find their calling. For over a quarter of a century, Aska Equipments, which has German and American technical collaboration, has been selling a variety of fire fighting gear. In 2008, the company invested Rs. 1 crore towards a set-up allowing modifications on the 180-kg, Rs. 1.1 lakh Bullet bikes with fittings of blinking lights, water cylinders, a first aid kit and oxygen packs for the fire fighters. 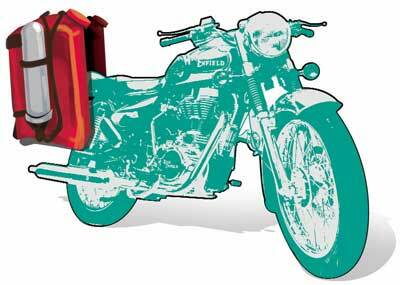 Aska Equipments’ bikes, labelled Blaze Buster, come painted red from the Royal Enfield factory. The two companies are in very early stages of talks to jointly work on exporting the bikes and selling them in the domestic market with the requisite safety guarantees. Aska Equipments, which earns Rs. 100 crore in annual sales, has sold 300 Blaze Buster bikes so far at Rs. 7-8 lakh apiece to some state fire departments and to some companies. It expects to sell an additional 300 modified Bullet bikes this year. Aska claims the bikes can reach a disaster site faster than a fire truck, easily navigating through crowded and narrow streets to douse a blaze.